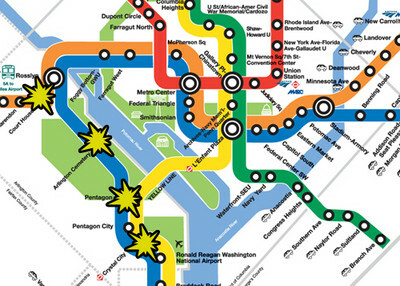 Federal agents arrested a man Wednesday for plotting to bomb the Washington, D.C., subway system, the Justice Department announced. It was the second arrest in as many days involving Americans hoping to wage violence for al-Qaida or the Taliban, and federal law enforcement officials believe it is part of a wider attempt to launch terrorist attacks. Farooque Ahmed, 34, of Ashburn, Va., was indicted Wednesday for attempting to provide material support to a terrorist organization, collecting information to assist in planning a terrorist attack on a transit facility, and attempting to provide material support to help carry out multiple bombings in the D.C. Metro subway system. Ahmed's arrest follows that of Abdel Hameed Shehadeh, arrested Tuesday in Hawaii for lying about a failed attempt to go to Pakistan and join the Taliban. Shehadeh said he was planning to travel to Pakistan to wage jihad, but after that plan failed he tried to join the U.S. Army. According to the indictment, Shehadeh said that in the Army he "would be provided with training, transportation and a weapon" that would help him attack Americans. Ahmed and Shehadeh are considered to be part of a wider plan by U.S. citizens or residents hoping to serve elements of the Taliban and al-Qaida to conduct terrorist attacks throughout the country, a federal law enforcement official told IPT News. There are multiple ongoing investigations of radical Muslims who are believed to have received training or direction from Pakistan-based terror groups in order to carry out attacks here, the official said. In the last eight months, U.S. authorities have detected a dramatic increase in the number of planned Islamic terrorist attacks in the United States or against Western targets abroad. Evidence for this comes from four categories, the official said. Evidence showing a substantive increase in international travel of terrorist operatives into the United States and Europe. They have either been dispatched by al-Qaida-linked groups or are "lone wolf" types who have connected to groups in both Pakistan and Yemen in order to volunteer to carry out attacks. Homeland Security Secretary Janet Napolitano said in a speech Monday that law enforcement officials believe terrorist groups are preparing to launch attacks. Those officials, she said, "are operating under the premise that individuals prepared to carry out terrorist acts are already in the country, and may carry out these acts of violence with little or no warning." Al-Qaida leaders outside the United States have increased their calls for attacks in this country. In May, Anwar al-Awlaki, an American cleric believed to be living in Yemen, issued a 45-minute video urging attacks on American civilians to retaliate for the deaths of Muslims in Iraq, Afghanistan and elsewhere. Awlaki invoked the Prophet Muhammad, whom he said waged battles that had civilian casualties. On Sunday, Adam Gadahn, a U.S. citizen turned al-Qaida leader, issued an Internet call for followers to stage attacks in the United States. "It is the duty of everyone who is sincere in his desire to defend Islam and Muslims today, to take the initiative to perform the individual obligation of jihad," Gadahn said in Arabic in the video. Ahmed and Shehadeh join a growing list of accused or convicted domestic plotters of terrorist attacks. In May, Faisal Shahzad, a U.S. citizen born in Pakistan, was arrested for trying to detonate a car bomb in New York's Times Square. He was sentenced to life in prison on Oct. 5. In February, Najibullah Zazi, a naturalized citizen from Afghanistan, was sentenced to life in prison for his role in a plot to attack New York's subway system. A naturalized U.S. citizen from Pakistan, Ahmed met with undercover law enforcement officers whom he believed were al-Qaida members, the indictment said. During these meetings between April and October 2010, Ahmed detailed his plans for a terrorist attack on the Washington Metro. He reportedly scouted numerous stops, including those at Arlington Cemetery, Crystal City, Courthouse and the Pentagon in Northern Virginia. Ahmed, the indictment said, picked these stops because military personnel use them regularly. Detailing the planned attacks, Ahmed told undercover officers he had taken notes and video to document security procedures and when the stops were the most crowded. Ahmed, the indictment said, determined the best time for an attack would be between 4 and 5 p.m. Attacks then would cause the most casualties. The plot would involve the use of rolling suitcases placed at predetermined locations within a number of metro stops for simultaneous attacks. In addition to planning attacks, Ahmed offered to provide financial support to al-Qaida. He wanted to donate $10,000 and said "he would collect donations from people even if he had to do it in the name of another cause, and send it to the organization in increments of $1,000 in order to not raise any red flags." "It's chilling that a man from Ashburn is accused of casing rail stations with the goal of killing as many Metro riders as possible through simultaneous bomb attacks," U.S. Attorney Neil H. MacBride said after the arrest. "Today's arrest highlights the terrorism threat that exists in Northern Virginia and our ability to find those seeking to harm U.S. citizens and neutralize them before they can act." Ahmed is scheduled to be arraigned Wednesday afternoon in federal court in Alexandria, Va. If convicted, Ahmed could face up to 50 years in prison. It seems $2 Billion is not enough as protection money. Politicians are allowing crooked bankers to destroy US from within and helping jihads to destroy from outside. Why did you tag this as "homegrown terror"? This is Pakistan-grown terror. If some creep from Pakistan manages to get naturalized and then goes jihad on us, that's not "homegrown terror" in my book.